Ah, chia seeds. You may immediately think of the Chia Pet commercials from way back when, or you may think of a nutrient-powerhouse. 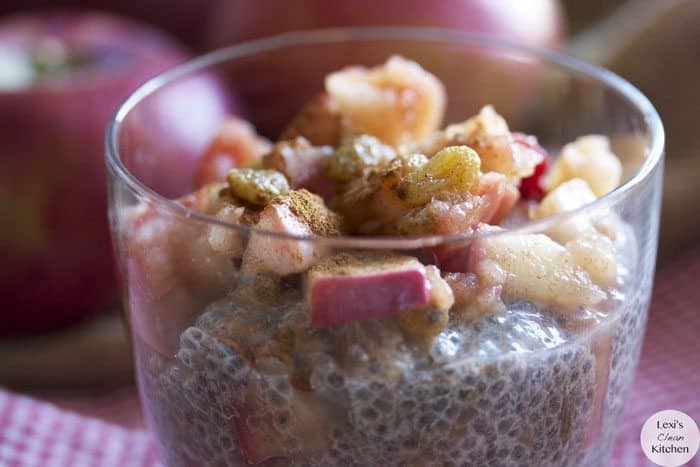 Regardless of what comes to mind, there is a ton to be said about chia seeds, their texture, how you can cook with them, and their nutritional benefits. For months now I have been looking for a breakfast option to take place of the beloved oatmeal that I no longer eat. When oatmeal was in my life, one of my go to breakfast meals, or an on-the-go lunch meal, was a simple bowl of oatmeal (or overnight oats), infused with flavors such as berry, banana, chocolate, and espresso. It was always a delicious option and took about 2 minutes to put together. Since making the decision to remove grains completely from my diet, I have been missing that go-to quick meal. 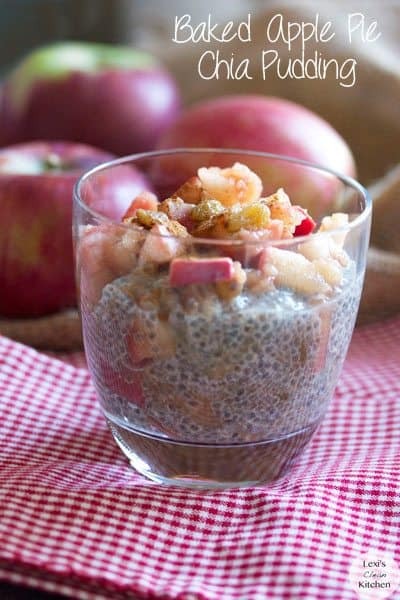 Until now, dun, dun, dun… I generally use chia seeds in smoothies and in my homemade jam; I love how they expand and thicken, I REALLY like their nutritional value, and I really enjoy the texture. 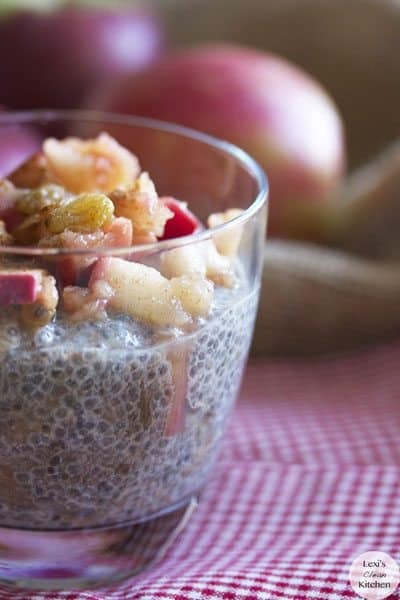 Making chia pudding could not be more simple, just like overnight oats. PLUS, you can get creative and make it to satisfy your favorite tastes and/or your sweet tooth. Now that Fall is in the air (and the farm is stocking up with my favorite Fall produce), I wanted to mix in something warm, like warm apple pie filling infused with just the right amount of cinnamon. You with me on this one? Packed with nutrients, delicious, and filling. Pure heaven, and took a total of 3 minutes to prepare! P.S. I am extremely excited about my birthday gift (the big day was yesterday), as it has to do with all of you! My brother, my mom, and Mike chipped in and got me the Macro lens for my DSLR that I have had my eye on for months! I am so excited to learn and grow through my food photography, and to share it with all of you. I pretty sure there are just a few recipes left to try until I run out! Once again, you are amazing. This tasted amazing. Could you substitute coconut milk for the almond milk? I know this post is 5 years old, but I just found it via pinterst. I had to comment to tell you how wonderful it was! I made this and another recipe from another site (peanut butter and blueberry flavor) and this blew that one away! It was so tasty. I upped the cinnamon just a smidge because i love cinnamon, and didnt bother reheating my left over apple compote – just threw it on top – and it was still fabulous! 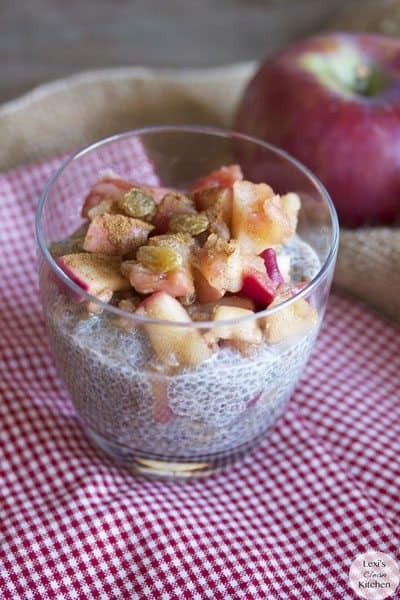 One of my go to breakfasts is oatmeal with apples added, so this was a perfect replacement!